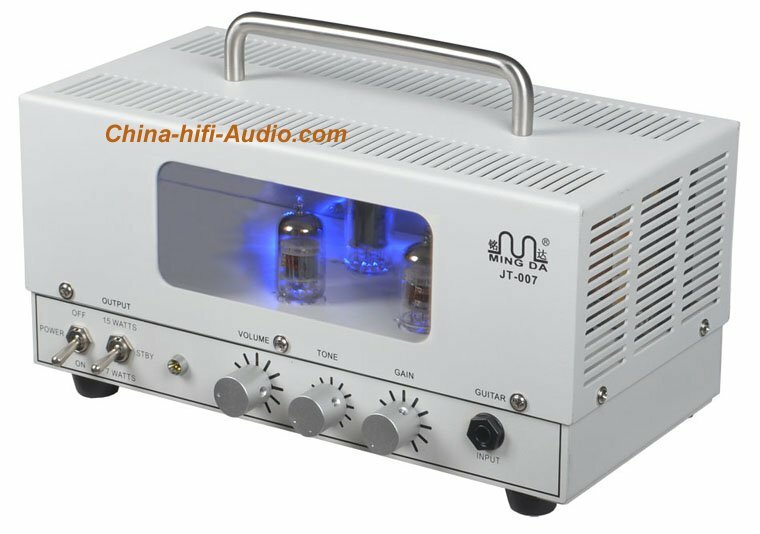 Guitar amplifier JT-007, all-tube design, with a unique two stage preamp design: The first stage uses a high magnification factor of 12AX7 / ECC83, high magnification, large gain, tone and delicate. The second stage utilizes the amplification factor 12AU7 / ECC82, moderate gain, reduce noise and distortion, enhanced thrust. The final stage of selection of Russian imports pretty sound tube EL84 / 6BQ5, charming and beautiful sound. Particular note is the machine's power transformer and output transformer all imported Z9 quality silicon steel by having more than two decades of experience in the old master craftsmen hand-wound. Power transformer capacity, long working hours, low temperature, which is the root cause of the machine where better than the other brands. In mechanical strength, this machine uses 1.5mm thick high quality steel molding, more high-end computer white paint on the air quality, very strong body and a protective cover. In ensuring a solid premise compact and lightweight, ideal for portable for small performances or rehearsals. Also you can switch from 15W to 7W, it has a better sound performance in a small volume, very suitable for home use, is absolutely the first choice guitar enthusiasts travel equipment. The front panel of the machine is designed with three control knobs, you can easily adjust the tone of their favorite three knobs are VOLUME, TONE, GAIN, there 15W / 7W / STBY (standby) control, ideal for under the environment of different sizes, in front of the guitar input jack can be connected to the output or microphone, you can also enter the MP3 audio or smartphone, and versatile. Well-designed blue backlight illumination, more fashionable, noble and elegant.